The internet is ripe with hobbyists building their own adorably tiny arcade machines, but those lacking basic electronics and soldering skills are left out of the fun, forced to feed quarters into full-size arcade cabinets. 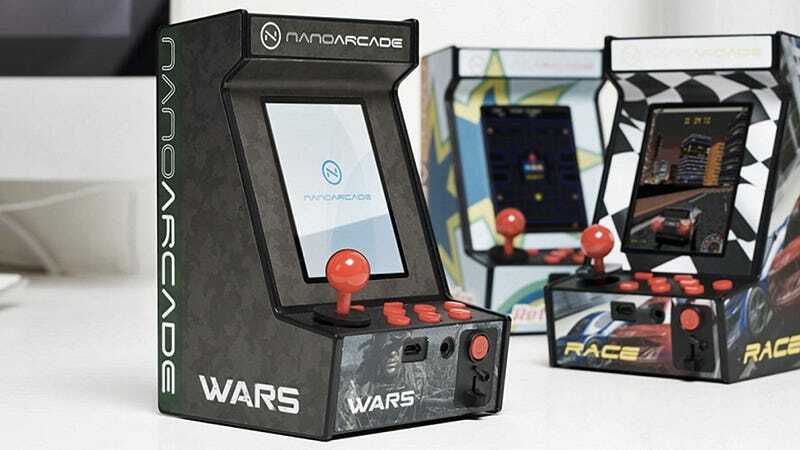 That's what makes the Nanoarcade so great, it's a fully-functional, tenth-scale arcade machine that comes completely assembled and ready to play with a working 360-degree joystick and six buttons—for just $40. The Nanoarcade's 3.2-inch LCD display, controls, and built-in speaker are all powered by a pair of AA batteries. So finding replacements if you're out and about is easier than locating a free outlet to charge from for half an hour. And in lieu of running MAME, the Nanoarcade runs Java giving it access to the thousands of J2ME games you enjoyed on your cellphone before the iPhone arrived. So while all of your favorite classic arcade titles aren't supported, there are certainly endless Java clones available that can be easily uploaded to the Nanoarcade using its microUSB port.